Luton chief executive Gary Sweet has hailed the January transfer window as a huge success for his side. The Hatters snapped up three players on loan today to make it five for the month, with Jason Cummings, Alex Baptiste and Aaron Connolly joining the already signed George Moncur and George Thorne. Departing on a permanent basis have been Akin Famewo, who was sold to Norwich City, and Jorge Grant, whose season-long loan from Forest was terminated at its midway point. There were also loan moves away for Aaron Jarvis, Lloyd Jones and Jack Senior, meaning that Town have seven players out now, including Frankie Musonda, Jack James, Luke Gambin and Jake Jervis. Reflecting on the month's business, virtually all done without a permanent manager after Nathan Jones left for Stoke City, Sweet said: “As is always the aim, we have come out of the transfer window considerably stronger than we went into it – and full credit to Mick Harford who has worked tirelessly and so successfully in two roles this month, along with every member of support staff. “We have brought five players in, four who have played Championship football in the last 18 months – including two from current promotion rivals – with the fifth being a highly sought talent from a Premier League club. 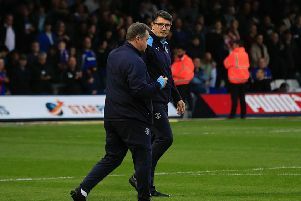 “We’ve allowed young players who need game time to go out on loan to good clubs in order to gain senior experience that will benefit Luton Town in the long term. “We’ve sold one for whom we terminated a long-term loan in order to give him the opportunity he wanted. “Most importantly, we have not received a single, formal bid for any of our players who have performed so fantastically well this season, which we are absolutely delighted about.